Track your tasks with an award-winning project management software! We’ve had a fantastic start to 2018 at Zenkit. We’ve released our desktop apps, released a major update to the way Zenkit looks and feels, welcomed many new users, and generally had an all-round good time. Now we have even more cause to celebrate, having received both the “Rising Star” and “Great User Experience” awards for 2018 from popular B2B review platform, CompareCamp. These awards were given after CompareCamp conducted an in-depth analysis of Zenkit, inspecting all aspects of our collaboration platform such as main functionalities, ease of use, integrations, and security, to name a few. 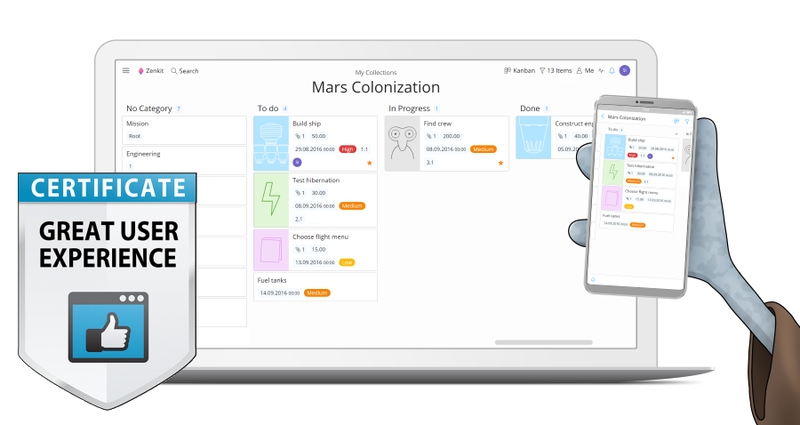 As our users know, we’ve been working very hard to add new features, but also focus on keeping a clean intuitive design to help everyone get more done. We’re very proud to be recognized for our hard work (and we promise to do our best to win an award for it in 2019 too). What we really want to say is, we’re just getting started. We hope to put all of you in a position to rule your office and create real value for whatever it is your passions are. 2018 should be an awesome year. Thank you, CompareCamp, for the recognition! If assistance with your Zenkit account is needed, then please get in touch with our customer support team on service@zenkit.com or by using the in-app chat accessed from your profile menu.